Despite its harsh winters and high concentration of buildings, Moscow is home to plenty of green spaces, parks and lush gardens. 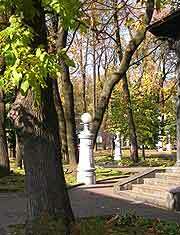 During the summer months, Moscow's gardens are at their best and used by many for relaxing, sunbathing, playing games and enjoying an ice cream, while in the ice winter months, the largest public parks lend themselves to a number of winter sports, such as ice skating. 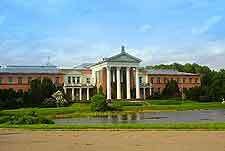 For an example of horticulture at its very best, both the Moscow Botanical Gardens (Botanicheskii Sad) and the Medicinal Botanical Gardens (Aptekarskii Ogorod Botanicheskii Sad) are not to be missed, being crammed with unusual plant species and extensive collections of flora. Also of interest and almost 200 years old, the Alexander Gardens, referred to in Russia as the Aleksandrovskii Sad, are extremely close to the Kremlin building. The Aleksandrovskii Sad gardens have led an interesting past and are today perhaps best known for being home to the famous Russian Tomb of the Unknown Soldier. The landscaping of these gardens is quite memorable and features a strong formal theme with square blocks of planting and narrow intersecting pathways, together with more relaxed areas of flowers and seating. 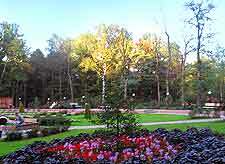 The Moscow Botanical Gardens can be discovered on the northern side of the city and when compared to the historic origins of many nearby parklands, are relatively young, being laid out in the middle of the 20th century. However, the plants here have definitely flourished and many mature trees provide shady areas, amongst the beautiful summer flower displays and themed gardens, which include a particularly tranquil Japanese area, complete with many authentic oriental features. Children will always enjoy a visit to the Garden of the Russian Army, since this attractive park boasts a popular pond, filled with hungry ducks. A scattering of benches provide plenty of pleasant vantage points, where you can sit back and enjoy the views. Also onsite are a number of eateries, a long and scenic pathway, and a particularly beautiful theatre. 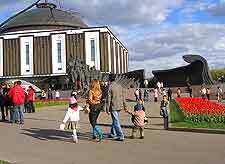 Gorky Park is one of Moscow's most popular parks and lies on the south-westerly side of the city centre, next to the winding Moskva River. Seasonal planting and themed gardens provide plenty of colour during the summer months, while the onsite auditorium offers an array of entertainment both by day and during the balmy evenings, often attracting large crowds. 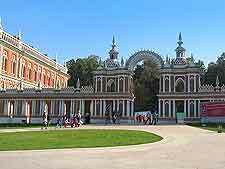 Most tourists tend to visit Moscow's Hermitage Gardens, known locally as the Ermitazhnyi Sad, for their numerous theatrical attractions. 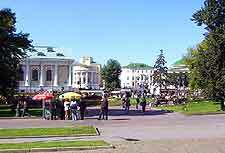 The park in home to the city's New Opera House and also the Hermitage Theatre, where regular musical performances, theatrical events and concerts take place each year. This beautiful park is more than 750 acres / 300 hectares in size and is amongst the most historic of all Moscow's parklands. There is plenty to see and do here, with highlights including a boating lake, live entertainment and the ever-popular Izmailovo Market, which regularly takes place here and is filled with an interesting selection of goods. The northerly Sokolniki Park is regularly frequented by resident Russians living in this part of Moscow and is known for its large exhibition pavilions. The park of today was actually laid out just over 80 years ago, and has been used over the years by the local royalty for a number of recreational activities, including falconry, shooting and strolling. Home to one of the city's most extensive collections of unusual plants, the Moscow Medicinal Botanical Gardens contains literally thousands of different plant species and encompasses an area of approximately 15 acres / 6 hectares. The gardens are known to date back as far as the early part of the 18th century and contain glasshouses, a large arboretum area and the city's oldest surviving tree. This pleasant recreation space is particularly historic and dates back to the latter part of the 17th century. Tsaritsyno Park is situated on the northerly side of Moscow and features many eye-catching statues and sculptures, along with tree-lined walkways, a series of neatly clipped lawns and many rather tropical-looking plants. This vast public space lies to the south of central Moscow and covers a staggering area of more than 1,300 acres / 525 hectares. The landscaped area boasts many impressive water features and attractions, including pavilions, a notable restaurant, statues, the magnificent Lesser Palace and also the popular Opera House, which hosts a notable exhibition of ceramics. 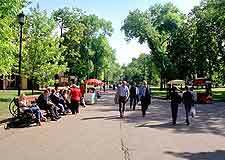 Park Pobedy can be found on the western side of Moscow and offers an array of typical parkland attractions, including open spaces, landscaped areas, fountains and plenty of seating. Also here is a small church and the poignant Central Museum of the Great Patriotic War (Tsentral'noi Muzei Velikoi Otechestvennoi Voiny), which remembers the devastation caused by the Second World War, and the various Russian military traditions.